YouTube lets you download the videos you've uploaded to the service, but the feature has a lot of limitations. "You can download MP4s of your own uploads, so as long as they do not have any copyrighted content or an audio track added through the Audio tool." But that's not all: "there is a limit of two downloads per hour for downloading your video to MP4. The Download MP4 button will not appear next to your videos if you've already downloaded two videos in an hour." The limitations are absurd, considering that they are your videos and you've uploaded them. There are many services and apps that let you download any YouTube video, but they break YouTube's terms of services. Fortunately, Google's Data Liberation launched a much better feature in Google Takeout: download the original videos you've uploaded to YouTube with one click. That's right, no more limitations, you can download all your videos and it's the only way to get the original versions, not the videos transcoded by YouTube. "No transcoding or transformation - you'll get exactly the same videos that you first uploaded. Your videos in. Your videos out," explains Google. Hopefully YouTube doesn't find out about this feature and cripple it with some preposterous limitations. YouTube find out about this feature? 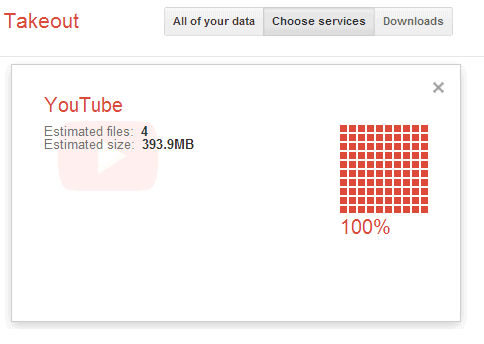 :D Alex, both are Google products and Google Takeout is designed to let you own your own data! It was supposed to be a joke. YouTube is a subsidiary of Google and operates as a separate business (YouTube, LLC) just like Motorola Mobility. YouTube doesn't look like a Google service, it's a powerful brand not many associate with Google and has a lot of quirky rules, just like Google Music. Some of those new UI prototypes for Youtube suggests that Google is planning to make Youtube more Google orientated and look more like a Google service than at presence. Righto. YouTube is getting a lot of Google+ style visual enhancements. The left aligned UI is something that is a major headache. It seems to me that the YouTube download limit is designed to make it less easy to use YouTube as a free bulk transcoding service, and not to lock your videos away from you. Your originals? Of course you can have them at any time. YouTube transcodes? There are limits. You can get all of them, just not fast. the only problem getting the originals is that you have to get them all in one go. you cannot get them individually. i have not yet tried exporting my videos but i am assuming you get a single archive for all the videos? You're right, you should be able to pick the videos you want to download. Using YouTube as a transcode service is a workable idea if you don't abuse it. If I can take a 1080i50 .TS stream which is 42 minutes long and weighs 2.7GB, spend two hours uploading it via ADSL to YouTube, wait ten to twenty minutes for it to be available then use KeepVid to download the result which takes another ten to twenty minutes I end up with a 1080p25 file which is one third to one quarter the size of the original and I didn't have to spend ten hours transcoding it myself.